You're invited to Songs of Resistance, a night of music and solidarity, featuring radical troubadour David Rovics with a special appearance by Swedish artist Elona Planman. Tickets available in advance for $15 at: songs of resistance David Rovics in concert tickets or $20 at the door. No one turned away. Don't miss the discussion prior to the concert, starting at 6:30 pm, on the topic "Understanding Civil Resistance". Please help spread the word & see you on November 22nd!! The Saanich Peninsula First Nations are promising a battle on the land, the sea and in the courtroom if Steelhead LNG plans to go ahead with a liquefied natural gas plant on the former Bamberton development lands. Standing on Tsartlip First Nation land looking across Saanich Inlet at the site of the former cement factory where Steelhead envisions its project, the chiefs of the Saanich Peninsula nations — Tsartlip, Tsawout, Tseycum and Pauquachin, known collectively as WSANEC — made it clear they are united in opposition. David said opposition to the project seems to have fallen on deaf ears at the Steelhead offices. Victoria councillors Jeremy Loveday and Ben Isitt hope to encourage more ethical investments of city dollars. The two, in co-operation with the University of Victoria Student Society, are hosting a town-hall meeting tonight to explore alternatives to the current situation, in which municipal funds are invested in pooled portfolios largely out of the city’s control. Isitt said a concern he has, for example, is that Philips, Hager & North has taken the position that investment in the oilsands is consistent with the principles of socially responsible investing. “Many people have a different view,” Isitt said. The purpose of the town hall, he said, is to explore how to ensure city funds are being used “as a force for good rather than for harm” in terms of environmental and social issues. Unfortunately, Isitt said, the city’s discretion is limited legislatively. Speakers at the event include Kelsey Mech, chair of the Canadian Youth Climate Coalition, Nathalie Chambers of the Farmland Protection Coalition, and peace activist and former Green party leader Joan Russow. The event is planned for 7 p.m. tonight at the Downtown Community Centre, 955 Pandora. POVERTY & UNEMPLOYMENT ARE THE REAL THREATS! May 1st is set aside in most countries around the world as International Labour Day. The Victoria May Day Committee together with CUPE Locals, International Solidarity groups, IWW and the Work Less Party of BC continues to work towards a meaningful marking of this occasion and its importance to the international working class. May Day celebrates the social and economic achievements of the international labour movement and promotes social justice and internationally recognized human and labour rights. 812 Wharf Street and Government St with live music, information and march to Centennial Square for food starting at 5pm. Music: Nedjo Rogers, Art Farquharson, John Shaw. Worker’s Communist Party of Iran longtime, activist in labour and human rights. 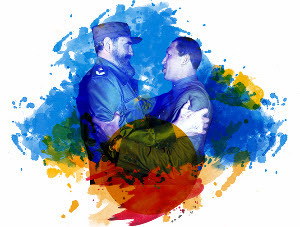 Canadian Union of Public Employees and member of the Central American Support Committee. Merli Vanegas, Consul General of the Bolivarian Republic of Venezuela in Vancouver. 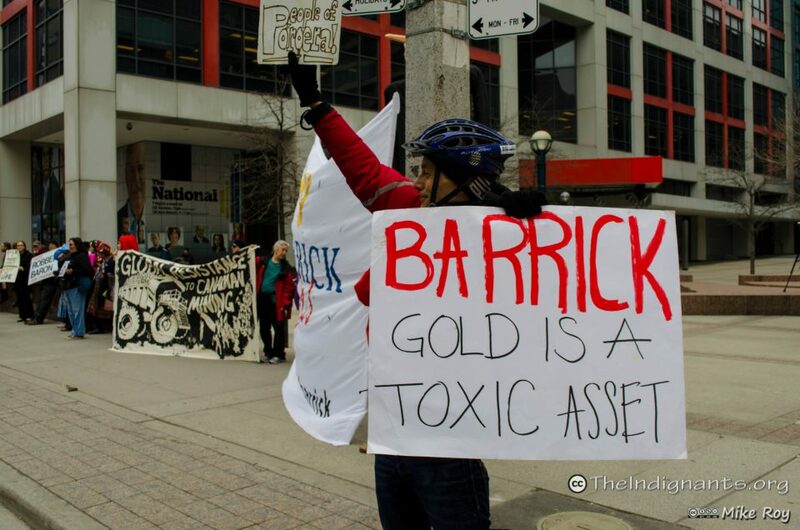 John Baird, who resigned last month as Minister of Foreign Affairs, has landed a job as an advisor with Barrick Gold, a corporation that received subsidies for its mining operations from the government during the time Baird was in the Cabinet. The announcement shortly after Minister Baird became the minister that Canadian International Development Agency (CIDA) was ‘partnering’ with Barrick Gold in Peru, where the mining company was facing growing protests from the locals, while slashing funds long standing foreign aid groups caused astir three years ago. Rupert Yakelashek, 10, wants the City of Victoria to stand up as a leader in declaring the right to a healthy environment. A local kid is making it his priority to ensure the citizens of Victoria have the right to a healthy environment. Rupert Yakelashek, 10, went to David Suzuki’s Blue Dot Tour in Victoria in November, where he was inspired to bring about environmental change in Victoria. “[Suzuki] said that Canada had fallen behind in the environmental race and that many countries have environmental rights, but not Canada,” said Yakelashek. During the municipal election, Yakelashek brought letters to each of the candidates in Victoria asking them to support a declaration for the right to a healthy environment. He made a lasting impression on Coun. Jeremy Loveday in particular. The declaration states multiple environmental rights of humans, such as the right to breathe clean air, the right to drink clean water, the right to consume safe food and the right to participate in decision-making that will affect the environment. The declaration also states that the City of Victoria should take cost-effective measures to prevent the degradation of the environment and protect the health of its citizens. Loveday put forward a motion, endorsed by Coun. Ben Isitt and Mayor Lisa Helps, to adopt the declaration. Yakelashek is going to City Hall on Thursday night (Dec. 18) to bring his message directly to council and relay to it and the public why it is an important initiative to support. There will be a rallyimmediately prior to the meeting at 6:45 p.m. at the Pandora Avenue entrance to city hall. “If humans are harming the environment, we’re directly harming ourselves,” said Yakelashek. While it is a declaration and not a bylaw, Loveday said supporting it at the municipal level is the first step. “The plan is to have municipalities recognize the right to a healthy environment in declarative statements, and then from there get provinces to make the same statements,” said Loveday. Eventually the rights could get passed at the constitutional level. More than 100 other countries in the world already have the right to a healthy environment in their constitutions. “Victoria would be a leader in it as we’d be the first city on Vancouver Island and the sixth city across Canada to sign on,” said Loveday, adding the declaration lines up with the city’s official community plan and could be used as a reference for future projects. Supporting this declaration is a strong statement for the environment moving forward, said Loveday. Pacific herring stocks are shadows of their former abundance. But the Canadian government wants to reopen fishing off British Columbia. Pacific herring in British Columbia, Canada, come near shore in massive schools every spring to spawn. The Pacific herring­an oily, silvery, schooling fish­is rarely high on the list of marine animals people fret about. But for the second straight year, the Canadian government has ignited a skirmish in British Columbia by moving to let fishing nets scoop up spawning herring, despite objections from scientists, Native people, and even commercial fishing groups. "Last year it almost got to a war­locals were geared up to block fishing boats in port," said Tony Pitcher, a fisheries scientist with the University of British Columbia. "There were more police on the dock than there were local people." This unusual battle is part of a global debate about the future of some of the oceans' most important fish: the abundant schools of sardines, squid, smelt, anchovies, and herring that serve as forage for larger animals in the sea. Scientists like Pitcher argue that too few governments take into account the essential role these forage fish play in marine systems before deciding how many of them can be caught. Canada and its politics, the former Ontario NDP leader says, are in free fall. 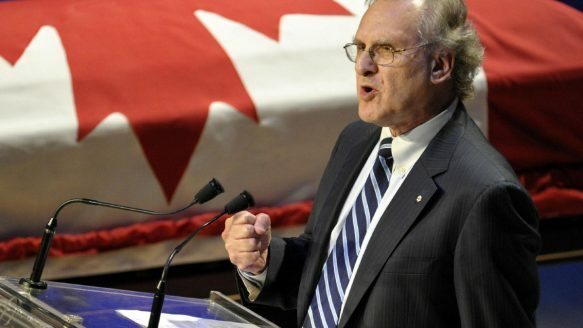 In his Friday speech, Stephen Lewis took aim at the “pre-paleolithic Neanderthals” in office. At the age of 77, Stephen Lewis describes himself as being “happily in his dotage,” a man free to bare his soul and dispense with diplomatic niceties. He did just that in Charlottetown last Friday. The one-time lion of the left unleashed a withering roar over eight years of Stephen Harper government that deserves to be moved from the relatively tiny confines of the Confederation Centre of the Arts and into a larger forum. VICTORIA—The Legislature Lawn is slated to be transformed into an outdoor "peoples' classroom" by students, parents, teachers and community members on Tuesday Sept 2nd if the BC government does not reach a settlement with the teachers first. "Christy's Classroom" will open with the ringing of a school bell at 9AM on Tuesday, the day classes are scheduled to start in BC's public school system.